This article presents a successful story of JCSAT-14, which was launched by SpaceX's Falcon 9 in May 6, 2016 from CCAFS, Floria and placed into a geostationary orbit in May 16. The JCSAT-14 satellite was launched in May 6 2016 by a SpaceX's Falcon 9 launch vehicle. The launch campaign continued for two months. This article presents the latter half of the launch campaign after the middle of April. Scott Patterson:"Dark Pools: The Rise of A.I. Trading Machines and the Looming Threat to Wall Street", Random House Business Books, 2013. "The book of the ultra-fast trading of stock was introduced in this previous column that it is the most distant presence in satellite communications. After that, there is a book review that stock trading has a greater impact than the high-speed communication lines due to activity of Artificial Intelligence (AI) in this field. Although I would like to treat the book, I am interested in the problem of AI itself and took out and introduced the most appropriate book. Now, it is the time to introduce this book that treats the stock trading using AI." 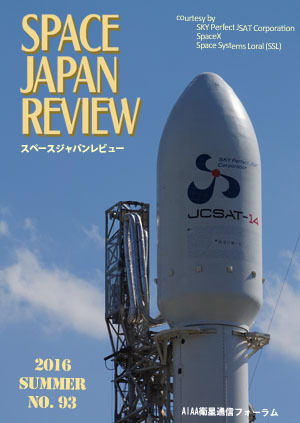 "See through the evil that was hidden in the back of a dream"
"Development of On-board Communication Equipment for Overseas Communication Satellites"
"Towards the future when Japan's space industry leads the world"